​More books have been written about the Battle of the Little Bighorn than about any other battle in United States history—more, reportedly, even than about Gettysburg. There is almost literally no end to the volumes one could read. Here are just a handful of recommendations from Neil, our expert guide, and from myself, a non-expert, but dedicated student of the Indian Wars. Critics will cite strong points and solid analysis, as well as errors or notable shortcomings in each of these volumes, but such is the bookshelf for any great event in history. For the Battle of the Rosebud, our first big battlefield hike in our October tour, pick up the definitive study, Battle of the Rosebud: Prelude to the Little Bighorn, by Neil Mangum (Upton and Sons, 2012). See also the classic, With Crook at the Rosebud, by J. W. Vaughn, with an introduction by Brian Pohanka. For the Battle of the Little Bighorn . . .
For overall campaign studies: ​Custer's Luck, by Edgar Stewart, has been in print since 1955 but is still outstanding. The second overall campaign study to pick up is John Gray’s, Centennial Campaign: The Sioux War of 1876. Some Indian and soldier perspectives on the battle I would suggest: Custer in 76: Walter Camp's Notes on the Custer Fight, edited by Ken Hammer. Robert Utley's, The Lance and the Shield: The Life and Times of Sitting Bull, is excellent biography of Sitting Bull. Finally, the very best book on the battle for the general public remains the National Park Service handbook on the battle of the Little Bighorn, available online here. (NPS), and here (Internet Archive). I am greatly enamored of Richard Fox’s, Archaeology, History, and Custer’s Last Battle: The Little Big Horn Re-examined. I heartily recommend Evan Connell’s, Son of the Morning Star. The great novelist made some mistakes (this being one reason Neil did not include this title in his recommendations), but the power of his prose and storytelling gives readers a unique appreciation for the subject matter that will open the door to more rigorous historical treatments. For my money, another useful volume is Frederic Wagner’s, The Strategy of Defeat at the Little Big Horn: A Military and Timing Analysis of the Battle. A fantastic collection of essays from the 1994 Little Bighorn symposium features a first-rate lineup of historians: Legacy: New Perspectives on the Battle of the Little Bighorn, edited by Charles E. Rankin. See also this volume from Rocky Mountain College professor Tim Lehman, Bloodshed at Little Bighorn: Sitting Bull, Custer, and the Destinies of Nations. 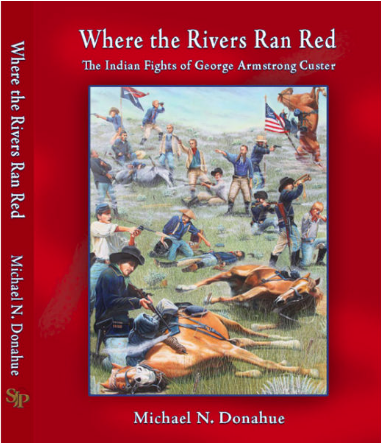 Where the Rivers Ran Red: The Indian Fights of George Armstrong Custer, by Michael Donahue, was just published this spring (San Juan Publishing). I purchased a copy, and can’t wait to dive in. It promises to be an important contribution to the literature by a long-time ranger at the battlefield. Donahue is also the author of the indispensable, Drawing Battle Lines-The Map Testimony of Custer’s Last Fight. See an early review of Where the Rivers Ran Red at the Friends website here. Where Custer Fell: Photographs of the Little Bighorn Battlefield Then and Now, by Brust, Pohanka, and Barnard; A Terrible Glory, by James Donovan; Lakota Noon, The Indian Narrative of Custer’s Defeat, by Greg Michno. See also, Michno’s, The Mystery of E Troop: Custer’s Gray Horse Company at the Little Bighorn; The Custer Myth, by W. A. Graham; Custerology: The Enduring Legacy of the Indian Wars and George Armstrong Custer, by Michael A. Elliott. A recent, popular history of the battle came from Nathaniel Philbrick, The Last Stand: Custer, Sitting Bull, and the Battle of the Little Bighorn (I've not actually read this book yet, given the backlog of titles on my nightstand, waiting for my attention). Some short but important memoirs include, I Fought With Custer, the Story of Sergeant Windolph, Last Survivor of the Battle of the Little Bighorn, foreword by Neil Mangum, and Custer's Chief of Scouts: The Reminiscences of Charles A. Varnum. In addition to the Utley biography of Sitting Bull mentioned above, other worthwhile biographies include Kingsley Bray's, Crazy Horse; T. J. Stiles’s Pulitzer Prize-winning, Custer’s Trials: A Life on the Frontier of a New America (though it gives only a cursory overview of the Last Stand), and Louise Barnett’s, Touched By Fire: The Life, Death, and Mythic Afterlife of George Armstrong Custer. Finally, there is an intriguing biography of the newspaperman who died with the troopers on that fateful day: I Go With Custer: The Life and Death of Reporter Mark Kellogg, by Sandy Barnard.